In 1971, San Clemente got a huge, brand new WTG complete with a Bradford House restaurant. It was located at 550 Camino de Estrella, and is now occupied by a Kmart. The restaurant is now a Little Caeser's Pizza Station. Grant's wasn't there more than 4 or 5 years before it was shuttered. who stay in touch with each other. If you are using firefox you will have to play with the options. It was originally between Wallace's Department Store, a local two-store chain, and the second home of Kresge's, which was torn down. I can't remember when this Grant's closed, but if it made it until '75, then it outlasted Wallace's and Kresge's. I remember they carried a line of appliances called "Bradford" -- my mother had a Bradford clothes dryer that lasted way more than 20 years. I recently saw a Bradford branded lawn mower somewhere, too, which surprised me. The 2-level WT Grant location in Eastland Mall in West Covina is still there, albeit hidden a bit. In the early 80's when the mall was enclosed, they converted the upper level to mall shops. They then built a Mervyn's store on the west end. It was a very weird conversion, as it had two halls with shops on both sides, but the middle shops were small and wide but not deep. The lower level actually stayed empty until the late 80's when Office Depot moved in. The store remained unaltered outside until the mall closed in the mid 1990's (due to the 4-level 300k+ sq ft May Co store closing). The Office Depot remained and is still open today. You can see in the middle of the store where the Escalators or stairs were once. The upper level became a Loehmanns, and part of the Babies R Us store. Loehmanns closed, became Levitz, that closed and now its empty. This store was one of the large Grant stores that was supposed to be 'just like Sears'. We had an auto service center, an interior decorator and sold appliances and furniture. We once had a W.T. Grant in Elizabeth City, NC that later turned into a Roses discount store. Roses kept and converted the Grant sit-down restaurant, and when I saw the above quote, I finally realized why there was an auto center directly attached to the former Grant's. Now a Merchant's Tire for as long as I can remember, I did find it odd when Roses was around to find a door leading into Merchant's, albeit partially blocked off by shelving, but still visible. 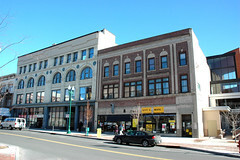 I worked in the Grant regional store in New Haven CT back in the 1950s. There was also a W.T. Grant in Panorama City, CA on the Southeast Corner of Van Nuys Boulevard and Chase Street. Can't tell you much more about the store as I don't think I ever set foot in there. Sometime after the store closed, a Savings and Loan moved in--probably Great Western Savings as the space was later a Washington Mutual, who had purchased Great Western. WAMU failed a couple of years ago and was taken over by Chase. So, courtesy of the W. T. Grant closing, some 30 years later we now have a Chase branch at the corner of Van Nuys and Chase! I wonder if the bank and the street are named after the same Chase? Barker Brothers: According to Mapquest, a "Coming Soon" Levitz. Orbachs: Now some sort of indoor swap meet per the sign outside. Have not confirmed if the builiding is even open. This is in Norristown, PA, but Grant built many stores like this across the nation. This store is a carbon copy of one in Shreveport, LA that closed in 2003 on Mansfield Road, that opened as a Kmart in 1976. Interestingly, the auto center in this store was leased out to a transmission company, and was not a Kmart Auto Center. It looks like this Kmart/Grant City opened in 1973, when the Genuardi Supermarket in this shopping center in Eagleville opened. So Kmart actually bought the Grant City stores? They never closed as Grant City? York also had a shopping center called Delco Plaza anchored by Grant City/Kmart AND a Hills/Ames. The center also had one of Pathmark's few Central PA stores. Delco Plaza was fully demolished for a center anchored by Giant, Lowe's, and OfficeMax. The Grant City in Clementon, NJ became a Woolco later, which is still abandoned to this day! One of the first ShopRite/Pathmark conversions was next door, and later a 70's Acme. W.T. Grant also seemed to have a few stores in shopping centers in the 50's. The one in Newtown Square, PA was subdivided into a True Value and a high-volume Thrift Drug/Eckerd/Rite Aid. Also note the similar one in Andorra, Philadelphia city which is now Staples. I wonder what that one was in between. The Grant City stores did close after W.T. Grant's huge liquidation sales. The leases were acquired by Kmart during and following the bankruptcy proceeding. This was the largest retail bankruptcy in history at the time, and it took a while. Kmart did light remodeling and some rearranging in the Grant City stores they occupied. They did not take all the Grant City stores; many went to other chains. One in Marianna, FL, even became a Woolworth that carried large appliances. Kmart never operated the stores with Grant merchandise though many fixtures and restaurant equipment was included in the lease takeovers. There was a distinct closure and reopening as Kmart's model was similar but fundamentally different from Grant City. There were odd holdovers here and there such as an occasional Kmart retaining waitress-service restaurants in former Bradford Houses. While Kmart has long been known for keeping touches of acquired stores, their overall store interior design in the 1970's was much more unified from store to store, especially prior to the adding of the former Grant locations. The Grant City locations Kmart took were typically in towns that had no existing Kmart. What intrigues me about Grant City is that it was the very first major big-box chain to go bankrupt and close. They were building/remodeling stores as late as 1974 too. Seems like a chain reaction happened when they shut down. Mammoth Mart in New England went bust in 1977. The Grants bankruptcy coincided with the original Penn Fruit bankruptcy (season of 1975-1976). At that point Penn Fruit closed a couple stores, but kept their name even after selling out to Food Fair/Pantry Pride (which was proposed to happen in the 50's at one point, but the deal fell through). Some stores that never converted from Food Fair to Pantry Pride even became Penn Fruit instead. And the Penn Fruit name was "resurrected" in 1977 on some stores that tried Pantry Pride or the Dale's discount name. But not five years passed before Food Fair went bankrupt. And they also took JM Fields general merchandise stores down with them. Then Two Guys sold their Philadelphia division to Jefferson Ward in 1980. Both Wal-Mart/Walmart and Target made landmark acquisitions in 1981 that inspired them to expand nationally. Target/Dayton Hudson bought the Ayr-Way department stores in Indianapolis. Wal-Mart (Discount City) bought a small discount chain called Kuhn's Big K. Then in 1982 Two Guys closed their New York stores, and Woolco closed all stores except in Canada. Wal-Mart took advantage of the Woolco collapse when they entered Houston in 1983. Jamesway picked up old Woolco stores and market share in the Philadelphia area. Gaylords closed or sold all their stores in PA/NJ/DE and other states. Nichols closed a round of stores in 1985 and converted the rest to "Pharmhouse" in 1990, which didn't last. Jefferson Ward became Bradlees' launchpad into Philadelphia in 1986. Target bought Richway in Atlanta in 1988. Zayre became a vehicle for Ames (along with TJ Maxx and BJ's in a way) in 1989. Jamesway began to collapse right as Wal-Mart entered the Northeast in 1990, while upgrading their fairly new store base in the South. Kmart started having trouble in 1994 and closed over 100 stores. Then Jamesway was a memory by 1996. Kmart tried to capitalize on the Venture bankruptcy by buying stores, but these closed in their own bankruptcy in 2002. And the rest of Venture closed in 1997-1998, months after assets were sold to Kmart. Ames bought Hills in 1998, which is said to be what brought down Ames in 2002. Caldor and Bradlees both had dramatic bankruptcies around the same time and nothing is really left of them anymore. The WT Grant Co was run wisely by family members (mostly in-laws) until the mid 1960s. once the greedy corporates took over and started screwing credit customers, refusing to stay with the times and building stores so close to each other it was downhill all the way until bankruptcy.